The C2D B3 Tone Wheel engine is the result of over a decade of perfecting our tone wheel simulations, a journey that started with the original Nord Electro and followed by the award winning Nord C1 and Nord C2 Combo Organs. Not only have we analyzed the signals from each of the 91 spinning tone wheels inside several original instruments – we have also paid years of attention to each and every one of the intricate details that make up the characteristics of the actual sound in a vintage organ. A new B3 Tone Wheel Bass feature gives you the classic 16′ and 8′ bass drawbars in the left hand and can even be used with the Piano and Sample section for a thick and meaty bottom. The Vox* Continental’s brute design brings you a more hollow tone, but with a very intense character. Both these transistor organs have their own unique, irreplaceable personalities. 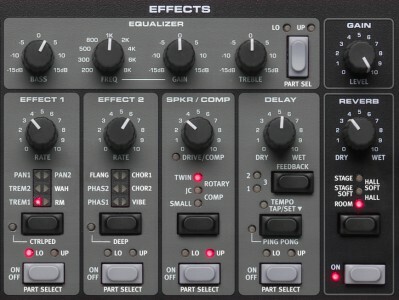 Combine them with any of the Amp simulations, add some distortion, adjust the EQ and they will definitely get you through any organ gig with flying colors. 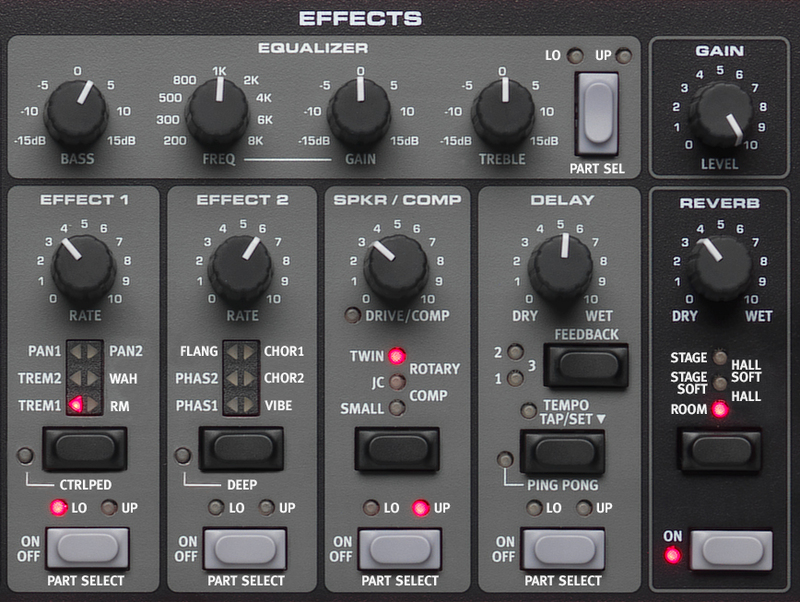 The Nord Electro 5 has 256 MB of memory dedicated to the Nord Sample Library. Our efficient, lossless compression algorithm makes it’s possible for us to fit samples up to three times the size compared to standard linear sample players. The Amp/Speaker simulation now features the same Vintage 122 Rotary Speaker simulations as found in our flagship organ, Nord C2D. 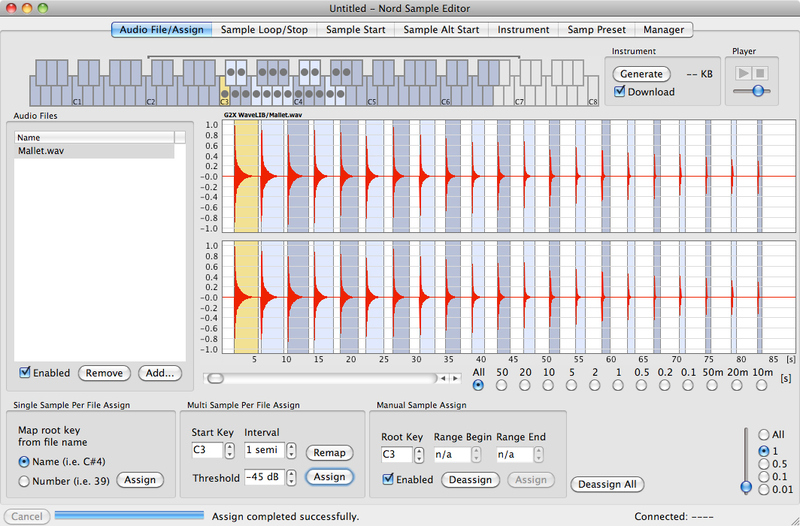 Also, there’s a flexible Stereo Delay effect with Tap-Tempo and Ping-Pong mode. Compressor/Amp – Twin, JC, Small, Rotary and Compressor and a new Tube Overdrive effect. The Nord Electro 5D 61 and 5D 73 uses Semi-Weighted organ type keys with a rounded “waterfall” tip, brilliant for rapid organ shredding and synthesizer licks, but also plays nice with piano sounds. Key range C-C on Electro 5D 61 and E-E on Electro 5D 73. The Piano Section has 6 categories – Grand, Upright, EPiano 1 (tine), EPiano 2 (reed) Clavinet and Harpsichord. 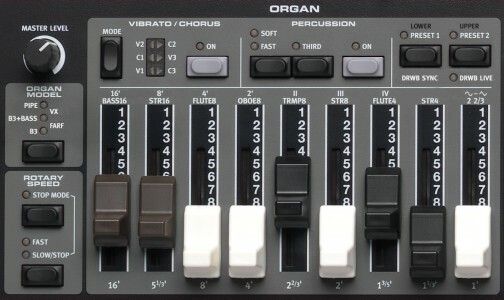 1 Control pedal input – ¼”, 6,35 mm TRS stereo jack, like Yamaha FC7, Roland EV-7, Roland EV-5, Korg EXP2 and Korg XVP10. 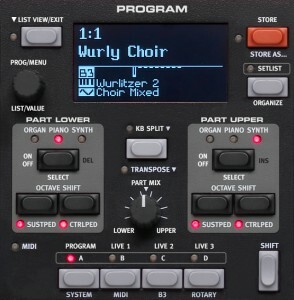 1 Sustain pedal input – ¼”, 6,35 mm jack. Use a momentary pedal, like e.g, Roland DP-2, DP-6, Yamaha FC-4, FC-5, Fatar VFP1-25 etc.